The Fulton County winners of the 30th Annual Franklin B. Walter All-Scholastic Award and Honored Teachers have been announced. Scholarship winners are - front, from left - Brendon Johns, Archbold, county winner; Brett Bettinger, Swanton; Sarah Schwan, Evergreen; Cassidy Vanderveer, Fayette; Alijah Lopez, Delta; Joshua Bock, Pettisville; Christina Norman, Wauseon. Honored educators are - back, from left - Brenda Beck, Archbold; Jay LeFevre, Swanton; Doug DeSloover, Evergreen; Pamela Schultz, Fayette; Stephanie Rayfield, Delta; Donna Meller, Pettisville; Katie Miller, Wauseon. Named after the Ohio State Superintendent from 1977-91, the award program recognizes outstanding student academic achievement in each school district, and the teachers providing students the most positive influence. It was established by the Ohio Educational Service Center Association. The Fulton County winners of the 30th Annual Franklin B. Walter All-Scholastic Award and Honored Teachers have been announced. 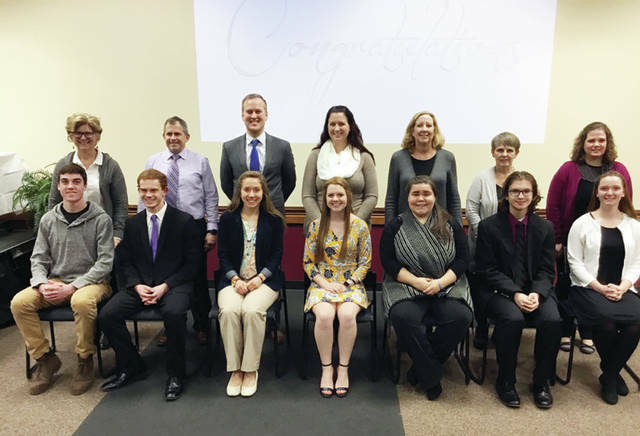 Scholarship winners are – front, from left – Brendon Johns, Archbold, county winner; Brett Bettinger, Swanton; Sarah Schwan, Evergreen; Cassidy Vanderveer, Fayette; Alijah Lopez, Delta; Joshua Bock, Pettisville; Christina Norman, Wauseon. Honored educators are – back, from left – Brenda Beck, Archbold; Jay LeFevre, Swanton; Doug DeSloover, Evergreen; Pamela Schultz, Fayette; Stephanie Rayfield, Delta; Donna Meller, Pettisville; Katie Miller, Wauseon. Named after the Ohio State Superintendent from 1977-91, the award program recognizes outstanding student academic achievement in each school district, and the teachers providing students the most positive influence. It was established by the Ohio Educational Service Center Association.